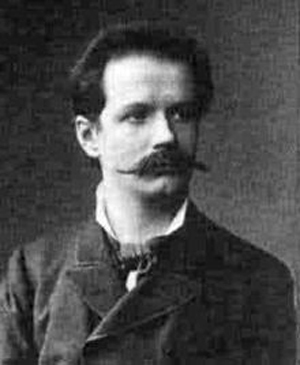 At the time of the 1876 Bayreuth premiere of Der Ring des Nibelungen, Alfred Pringsheim, the future mathematician and father-in-law of Thomas Mann, then a 25-year-old postgraduate student, displayed a sometimes unseemly fervor for Wagner’s masterpiece. In October of that year he fought a duel with pistols with the Berlin theater critic Isidor Kastan, who Pringsheim believed had insulted Wagner (fortunately no one was hurt), and after the premiere of Siegfried he fell into an argument with the Shakespeare scholar Friedrich August Leo in a tavern, leading him to hit the professor on the nose with a beer mug. The latter incident earned Pringsheim the nickname der Schoppenhauer (the beer-mug thumper). This according to “Der ‘Schoppenhauer’ und das Pistolenduell: Alfred Pringsheims kämpferischer Einsatz für die Bayreuther Sache” by Dirk Heißerer, an essay included in Alfred Pringsheim, der kritische Wagnerianer: Eine Dokumentation (Würzburg: Königshausen & Neumann, 2013, pp. 63–80). Below, Pringsheim’s arrangement of Wagner’s Siegfried Idyll for strings and piano.